We describe a protocol allowing the purification of the mouse brain's vascular compartment. Isolated brain vessels include endothelial cells linked by tight junctions and surrounded by a continuous basal lamina, pericytes, vascular smooth muscle cells, as well as perivascular astroglial membranes. Boulay, A. C., Saubaméa, B., Declèves, X., Cohen-Salmon, M. Purification of Mouse Brain Vessels. J. Vis. Exp. (105), e53208, doi:10.3791/53208 (2015). In the brain, most of the vascular system consists of a selective barrier, the blood-brain barrier (BBB) that regulates the exchange of molecules and immune cells between the brain and the blood. Moreover, the huge neuronal metabolic demand requires a moment-to-moment regulation of blood flow. Notably, abnormalities of these regulations are etiological hallmarks of most brain pathologies; including glioblastoma, stroke, edema, epilepsy, degenerative diseases (ex: Parkinson’s disease, Alzheimer’s disease), brain tumors, as well as inflammatory conditions such as multiple sclerosis, meningitis and sepsis-induced brain dysfunctions. Thus, understanding the signaling events modulating the cerebrovascular physiology is a major challenge. Much insight into the cellular and molecular properties of the various cell types that compose the cerebrovascular system can be gained from primary culture or cell sorting from freshly dissociated brain tissue. However, properties such as cell polarity, morphology and intercellular relationships are not maintained in such preparations. The protocol that we describe here is designed to purify brain vessel fragments, whilst maintaining structural integrity. We show that isolated vessels consist of endothelial cells sealed by tight junctions that are surrounded by a continuous basal lamina. Pericytes, smooth muscle cells as well as the perivascular astrocyte endfeet membranes remain attached to the endothelial layer. Finally, we describe how to perform immunostaining experiments on purified brain vessels. Proper function of the central nervous system (CNS) requires a highly regulated extracellular environment, and its metabolic demands are huge compared to other organs1. The CNS is also extremely sensitive to a wide range of chemicals, generally harmless to peripheral organs but to it, neurotoxic. To ensure correct functioning, most of the CNS' vasculature forms an endothelial barrier; the blood-brain barrier (BBB), which controls the flow of molecules and ions as well as the passage of immune cells between the blood and the brain, thereby maintaining proper homeostasis2, but also limiting the entry of therapeutic drugs, thus hampering treatments of neurological disorders3. At the cellular level, the BBB is mainly sustained by extensive tight junctions between endothelial cells, polarized expression of efflux transporters and a very low transcytosis rate4. Properties and functions of the BBB are mostly induced by neighboring cells4. In particular, pericytes play an important role in inducing and maintaining the BBB5,6. Being contractile cells, pericytes also regulate blood flow7 as do the smooth muscle cells surrounding large vessels. Finally, astrocytes, the major glial cells of the brain, send large processes named endfeet around most of the brain vasculature8 and modulate BBB integrity and immune quiescence9, the transfer of metabolites to neurons10, and induce the tight coupling between neuronal activity and blood flow11,12. The ability to study the molecular and cellular properties of the cerebrovascular system is crucial to characterize better its contribution to brain physiology and physiopathology. To tackle this question, strategies to isolate the brain's cerebrovascular system have been developed, which allow for the preparation of intact brain vessel fragments. Cerebral vessel purification was initially described using bovine brains13 and improved and adapted to other species, in particular rodents14. In this last study, the use of filters of varying size was introduced to separate brain vessels in to fractions enriched in vessels of different diameters. Interestingly, in such preparations, endothelial cells kept their metabolic properties15, transporter functionality16 and polarization17. Here, we describe in detail this protocol and further demonstrate that isolated vessels retain most of their in situ structures. Endothelial cells remain linked by tight junctions and surrounded by a continuous basal lamina. Pericytes and smooth muscle cells remain attached to the endothelial layer, as well as perivascular astrocyte membranes. However, astrocytes, microglial cells, neurons and oligodendrocytes are eliminated. Lastly, we describe a procedure to perform immunostaining on isolated brain vessels. Until now most of the molecular and cellular studies concerning the cerebrovascular system have been performed on purified brain vessel cells dissociated by cell-sorting using cell specific reporter mouse strains or immunostaining-based procedures18,19. Although these techniques allows for the isolation of almost pure cerebrovascular cell populations, isolated cells completely lose their in situ morphology and interactions, which in turn, greatly affects their molecular and cellular properties. The protocol described here, allowing for the isolation of whole cerebrovascular fragments with no need of specific antibodies or transgenic mouse stains, offers a good alternative as the overall structure of isolated cerebral vessels is conserved, thus, lessening repercussions on their molecular properties. Isolated vessels might then be used for studying gene activity, protein synthesis and regulation at the BBB as recently described20,21. Finally, compared to laser capture microdissection22,23 the present protocol is inexpensive, easy to perform and rapidly adaptable in to any laboratory. Prepare isolation vessel solutions: B1, add 1.5 ml of HEPES 1M to 150 ml of HBSS; B2, add 3.6 g of Dextran to 20 ml of B1; B3, add 1 g of BSA to 100 ml of B1. Modify the filter holder by cutting the bottom off the upper screwing part. Prepare immunostaining solutions: Fixation solution, 4% Paraformaldehyde in PBS pH 7.4; Permeabilization/blocking solution, dilute goat serum to 5% and Triton X100 to 0.25% in PBS pH 7.4. Note: Fixation depends on the type of primary antibodies used. Note: Sterile conditions are not required, unless vessels are used for cell culture purposes. Prepare a 150 ml beaker with 20 ml of B1. Keep on ice and cover with parafilm to avoid air contamination. Deeply anesthetize the mouse under a hood with a small paper towel soaked in 1 ml of pure Isoflurane that is added into the cage. Anesthesia is verified by a lack of reaction to a toe pinch. Kill the mouse by cervical dislocation. NOTE: These steps are accomplished in compliance with national and institutional regulations. Optional: Perform intracardiac perfusion with 20 ml of PBS 1x to eliminate the blood content24. Section the skin with a scalpel from the neck to the nose and pull it away. Remove all contaminating hairs with PBS 1x. To open the skull, first insert scissors anteriorly to the olfactory bulb, and open the scissors to rupture the skull in two parts. Carefully remove the brain using a brain spatula. Dissect out the choroid plexus from the lateral ventricles as they would contaminate the blood vessel preparation38. NOTE: Optional: The final preparation will contain parenchymal and meninges vessels. If not desired, meninges can be peeled off following the procedure described by 38. Transfer the brain into the beaker containing B1 solution on ice. Up to 8 brains can be treated together. Using two scalpels, manually and vigorously beat the brain in the B1 solution subsequently obtaining small pieces of about 2 mm. Homogenize the preparation with an automatized Dounce homogenizer, performing 20 strokes at 400 rpm. Ensure that the glass tube is maintained in ice and that the upper part of the douncer is in solution when moving up and down, so as to prevent the formation of air pockets. If several samples are prepared, wash the douncer with ionized water between each homogenization. Transfer the homogenate into a 50 ml plastic tube and proceed to the centrifugation at 2,000 g for 10 min at 4 °C. A large white interface (mostly myelin) will form on the top of the vessel pellet (red if no perfusion was performed) . Discard the supernatant. The vessel pellet and the white interface will remain attached together. Add 20 ml of ice-cold B2 solution and shake the tube manually and vigorously for 1 min. Proceed to the second centrifugation at 4,400 g for 15 min at 4 °C. The myelin will now form a dense white layer at the surface of the supernatant. Carefully detach the myelin layer from the tube walls by holding the tube and slowly rotating it to allow the supernatant to pass along the walls. Discard myelin with the supernatant. The pellet containing the vessels remains attached at the bottom of the tube. Blot the inside wall of the tube with an absorbent paper wrapped around a 5 ml plastic pipette and remove all residual fluids, avoid touching the vessel pellet. Keep the tube upside-down on an absorbent paper to drain any remaining liquid. Suspend the pellet in 1 ml of ice-cold B3 solution by pipetting up and down with low-binding tips , keeping the tube on ice, then add another 5 ml of B3 solution. Make sure that vessels are dispersed as much as possible and do not form aggregates. Prepare a beaker on ice with 30 ml of ice-cold B3 solution. Cover with parafilm to avoid air contamination. Place a 20 µm-mesh filter on a modified filter holder on the top of a becker flask and equilibrate by applying 10 ml of ice-cold B3 solution. Pour the vessel preparation on the filter and rinse the vessels with 40 ml of ice-cold B3 solution. Recover the filter using clean forceps and immediately immerse it in the beaker containing the B3 solution. Detach the vessels from the filter by shaking it gently. Pour the beaker content in a 50 ml plastic tube and centrifuge at 2,000 g for 5 min at 4 °C. Note: Alternatively, the brain vessels’ suspension from step 4.6 can be filtered onto a 100 µm-mesh filter. In this case, larger vessels are preferentially retained on the filter while the flow-through contains microvessels (mainly capillaries), which are then filtered on a 20 µm-mesh filter as above. Resuspend the pellet of microvessels in 1 ml of ice-cold B3 solution and transfer it by pipetting it into a 1.5 ml Eppendorf tube. Centrifuge at 2,000 g for 5 min at 4 °C. Transfer vessels by pipetting into 0.2 ml PCR tubes containing PBS using a 1.0 ml low binding tip. Be careful not touching the vessels as they may adhere to the outside part of the tip. Perform all the following steps under a binocular microscope. For each of the following medium changes, leave the tubes on ice until the vessels have reached the bottom, and pipette out most of the liquids using long and thing gel-loading pipet tips. Remove most of the PBS and add 200 µl of fixative solution. Suspend the vessels by shaking gently and incubate for 20 min at RT. Pipette out the fixative solution and replace it with 200 µl of 1x PBS (first wash), incubate for 5 min at RT and repeat this step 3 times. Each time, verify that vessels have correctly sunk to the bottom of the tubes and pipette out 1x PBS, ensuring the vessels are not touched. After the last wash, replace 1x PBS by the permeabilization/blocking solution and incubate 1 hr at RT, resuspending the vessels by shaking gently from time to time. Replace the permeabilization/blocking solution with the mix of primary antibodies (see references of the antibodies used here and dilutions in the Materials template table) diluted in the permeabilization/blocking solution, and incubate at 4 °C O/N. After 3 washes in PBS at RT, incubate the vessels with the mix of secondary antibodies diluted in PBS for 2 hr at RT. Note: we strongly recommend performing nuclear staining with Hoechst (1:2,000) or DAPI (1:2,000) in order to distinguish vessels from possible contaminating hairs or dusts under the microscope. After 3 washes in PBS, resuspend the vessels in 50 µl of PBS. Prepare a tip with a siliconized glass capillary: cut a P200 pipette tip using a scalpel and adjust the capillary inside. The approximate volume of the capillary is 40 μl. Transfer the vessels to a glass slide using the siliconized glass capillary and carefully remove the liquid with a piece of absorbent paper. Apply a single drop of mounting medium onto the vessels and hold a coverslip at 45º allowing the drop to spread along the edge of the slip. Let go off the coverslip and allow medium to spread slowly. Let it dry O/N at RT with protection from light. Vessels can be observed under a fluorescent confocal microscope. Here, we describe a protocol allowing for the mechanical isolation of brain vessels14. Figure 1 summarizes the main steps of this technique. The architecture of brain vessels is complex and includes several cell types, i.e., endothelial cells sealed by tight junctions and surrounded by pericytes, smooth muscle cells, and astrocyte foot processes9. Thus, following isolation of brain vessels, we aimed to characterize the structure of purified vessels by immunostaining as described in the second part of our protocol. Agrin, a component of the endothelial basal lamina was continuously and homogeneously labeled at the endothelial surface (Figure 2A). Zona occludens-1 (ZO-1), one of the components of endothelial tight junctions was immunostained with no apparent discontinuity, suggesting that endothelial tight junctions were preserved (Figure 2B). 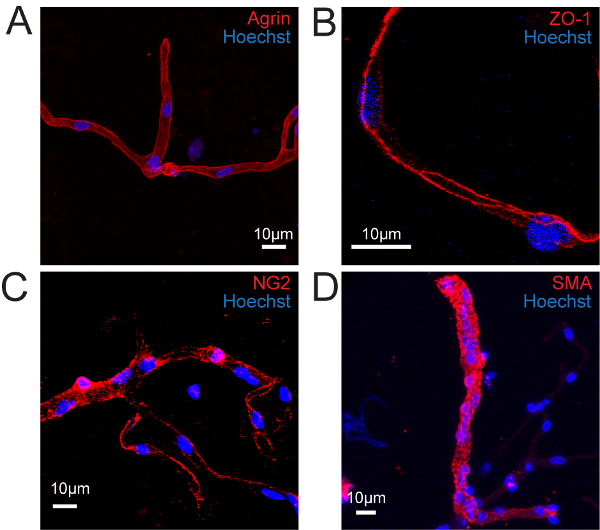 The pericyte endothelial coverage, labeled by NG2, appeared almost continuous as previously described25 (Figure 2C). Finally, smooth muscle actin labeling revealed the presence of a dense smooth muscle cell layer at the surfaces of large purified vessels (Figure 2D). These results showed that the overall in situ brain vessel structure was conserved in the isolated vessel fragments. Astrocytes have been shown to send large processes, or 'endfeet' to the surface of the vessels, sheathing almost entirely the cerebrovascular system8. Their tight interaction with vessels and their role in maintaining and regulating various cerebrovascular functions, designated them as a crucial part of the neurovascular unit9. We further analyzed the astrocyte vascular coverage of isolated brain vessels. Immunolabelling of the astrocytic intermediate filament Gfap, present normally in the whole astrocyte (Figure 3A), was only partially present on purified vessels showing some short fibers at the endothelial surface (Figure 3B-C). In contrast, Connexin 43, a gap junction protein highly enriched in perivascular astroglial membranes26, was highly detected at the surface of purified large vessels (Figure 3D) and capillaries (Figure 3E). Similarly, immunolabelling of Aquaporin-4 (Aqp4), a member of the water channel family greatly expressed at the level of astrocyte membranes facing the vessels 27,26, outlining the walls of isolated vessels (Figure 3F-G). Although astrocytes were not co-purified with vessels, their perivascular endfeet membranes remained attached during the mechanical procedure of brain vessel isolation. Finally, we examined the possible contamination of our preparations by other neural cell types. Immunolabelling of neuronal intermediate filaments (NFM) (Hornung et al, 1999) revealed the presence of few remaining fibers attached to the vessels, indicating a possible co-purification of a few neuronal terminals (Figure 4A-B). 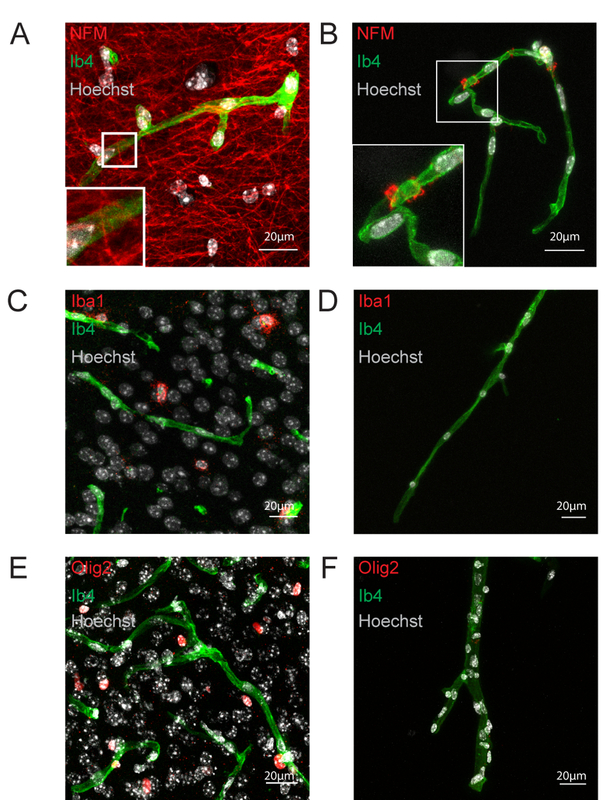 Microglia, labeled by Iba1 (Figure 4C-D) and oligodendrocytes, labeled by Olig2 (Figure 4E-F) were not detected in isolated vessels. Thus, neurons, microglia and oligodendrocytes were not co-purified with the brain vessels. Together, these results indicate that the described protocol allows the purification of structurally preserved brain vessel fragments, upon which perivascular astrocytic membranes remain attached. Figure 1. Summary Scheme of the Brain Vessel Purification Protocol. The principal steps are presented. This sketch indicates the three possible vessel fractions that can be obtained depending on the filters used (20 or 100 µm-mesh). S1: microvessels and large vessels, S2: large vessels and S3: microvessels. Please click here to view a larger version of this figure. Figure 2. Isolated Vessels Retain Most of Their In Situ Structure. Confocal image projections of immunostained isolated mouse brain vessels. (A) Basal lamina immunolabelled for Agrin (red). (B) Endothelial cell tight junctions immunolabelled for Zonula Occludens (ZO-1) (red). (C) Pericytes immunolabelled for NG2 (red). (D) Smooth muscle cells immunolabelled for Smooth Muscle Actin (SMA) (red). Nuclei are stained with Hoechst (blue). Please click here to view a larger version of this figure. Figure 3. Astrocyte Endfeet Membranes Remain Attached to the Purified Vessels. Confocal image projections. (A) Image of a brain section showing a cortical vessel immunostained for endothelial Pecam (white), astrocytic Gfap (red) and Connexin 43 (Cx43) (green). (B, C) Gfap immunolabelling (green) at the surface of an isolated capillary labeled by Isolectin b4 (white) (B) or of a large vessel labeled for Smooth Muscle Actin (SMA) (red) (C). (C) is a Re-print with the permission from20 (D, E) Cx43 immunolabelling (green) at the surface of an isolated capillary labeled by Isolectin b4 (white) (D) or of a large vessel labeled for Smooth Muscle Actin (SMA) (red) (E). (F, G) Aquaporin 4 (Aqp4) immunolabelling (green) at the surface of an isolated capillary labeled by Isolectin b4 (white) (F) or of a large vessel labeled for Smooth Muscle Actin (SMA) (red) (G). Nuclei are stained with Hoechst (blue). Please click here to view a larger version of this figure. Figure 4: Neurons, Microglia and Oligodendrocytes are Not Co-purified with Brain Vessels. Confocal image projections. (A, B) Neurofilament (NFM) immunostaining on a 20 µm-thick hippocampal slice (red) (A) and purified brain vessels (B). (C, B) Microglial Iba1 immunostaining on a 20 µm-thick cortical slice (red) (C) and purified brain vessels (D). (E, F) Oligodendrocyte Olig2 immunostaining on a 20 µm-thick cortical slice (red) (E) and purified brain vessels (F). Nuclei are stained by Hoechst (white), endothelium by Isolectine b4 (Ib4) (green). Please click here to view a larger version of this figure. The blood–brain barrier regulates the passage of physiological substances in and out of the CNS and protects it against potentially harmful substances present in the blood. It is involved in several CNS pathologies, including neurodegenerative diseases2 and brain tumors28. The extremely low permeability of the BBB hampers also the passage of therapeutic agents targeting neural cells and the development of methods intending to reversibly open the BBB with no deleterious consequences for the brain is a very active field of research3. Many efforts have been made to develop valuable models and techniques allowing cellular, molecular and pharmacological investigations of the BBB, and in particular, protocols for isolating vessels from the rodent brain. First attempts simply collected microvessels from mechanically dissociated cerebral tissue using variable pore-sized meshes to discard contaminating brain parenchymal cells13,29,30,31. Density gradient centrifugation was later introduced associated to filtration of brain vessels on nylon meshes or on glass beads columns 32,33,15. 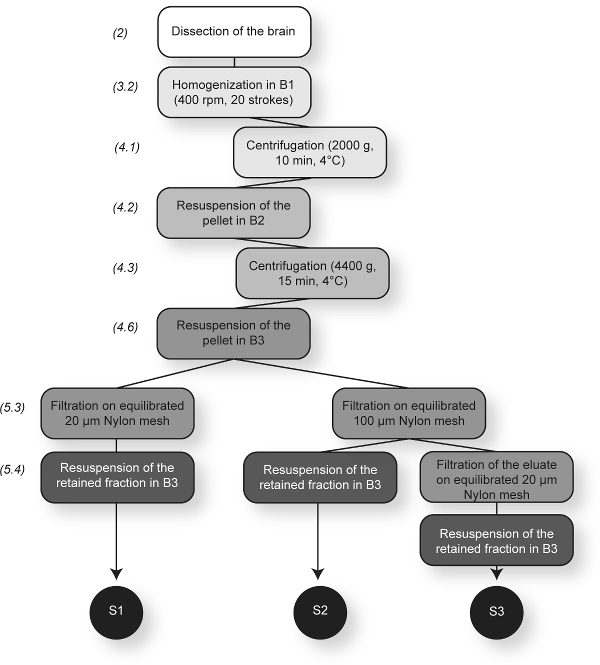 In these procedures, glass bead versus nylon mesh filtration appeared to improve yields and high- versus low-speed centrifugation, microvessel purity, although high-speed centrifugation induces also shear stress which affects gene expression 15,32. An additional step of enzymatic digestion was also introduced in some protocols following the dissociation step 34 with the aim of detaching adherent neurons and astrocytes to increase microvessel purity 35. However, an excessive pre-digestion could also disrupt microcapillary integrity 36,37. More recently, immuno-laser capture microdissection (immuno-LCM) has been shown to enable the retrieval of vessels or even of distinct cell populations in vessels, to examine changes in BBB gene expression, although the amount of material obtained by this technique is very limited 23. Here, we present a procedure for a mechanical isolation of brain vessels initially elaborated by Yousif et al14. It offers the possibility to obtain pure brain vessels, and to separate them according to their diameter. This protocol does not pretend to allow the purification of the entire brain vascular compartment, and we did not compare its efficacy with the previous published protocols. However, the absence of gradient, specific columns and high-speed centrifugation steps makes the overall procedure very easy and inexpensive. Importantly, we strongly recommend to remove the choroid plexus as described by 38 before homogenization of the brain, as we experienced it as a possible source of contamination. Other important recommendations are: 1) the use of “low binding” plastic material (in particular pipette tips) since vessels adhere naturally to untreated plastics. Omitting this point would result in the loss of most vessels; 2) the careful equilibration of nylon filters prior to filtration (step 5.2); 3) The resuspension of the pellet in as much buffer as possible before filtration to enhance the purity of the sample; 3) If necessary, blood cells and proteins trapped in purified vessels can be washed out by intracardiac perfusion with PBS prior to brain dissection; 4) The yield of vessels purified might be improved by repeating the separation from the myelin in dextran two or three times (step 4.2)39,40. For immunostaining, we strongly recommend: 1) to perform a nuclear labeling in order to distinguish vessels from contaminating hairs and dusts for which antibodies have great non-specific affinity; 2) to avoid collecting the vessels by centrifugation before each medium change as it may result in the formation of an inextricable ball of material. Purification of intact brain vessels present great advantages to study the molecular characteristics of BBB. Although specific or enriched endothelial and pericyte genes and pathways have been identified by transcriptomic and proteomic studies on individual cell types18,19, it is well known that dissociation and cell sorting techniques lead to the loss of cell polarity and morphology as well as interconnection between cell types, which strongly impact their molecular profiles. In this context, keeping the entire vascular compartment intact as described here, with the exception of astrocytes, might represent a great advantage. Moreover, compared to cell sorting, purification of brain vessels does not require the use of specific transgenic reporter mouse strains or lengthy immunostaining-based procedures. Another advantage to the use of brain vessels is the possibility of adapting the purification protocol to other species as already shown for murine14, bovine13 as well as in humans 41,42. Finally, a further development of the present technique would be the in vitro culture of brain vessels fragments. Co-culture of purified vessels with primary astrocytes neurons and microglial cells might help to reassemble the neurovascular unit in an accurate way than complex 3-dimensional multicellular culture systems where cells are first isolated and purified before being reassembled 43. Thus purification of intact brain vessels might be of great help for the development of any type of in vitro assays to study the BBB. Rolfe, D. F., Brown, G. C. Cellular energy utilization and molecular origin of standard metabolic rate in mammals. Physiological Reviews. 77, (3), 731-758 (1997). Zlokovic, B. V. The Blood-Brain Barrier in Health and Chronic Neurodegenerative Disorders. Neuron. 57, (2), 178-201 (2008). Pardridge, W. M. Blood-brain barrier delivery. Drug Discovery Today. 12, (1-2), 54-61 (2007). Abbott, N. J., Patabendige, A. A. K., Dolman, D. E. M., Yusof, S. R., Begley, D. J. Structure and function of the blood-brain barrier. Neurobiology of Disease. 37, (1), 13-25 (2010). Daneman, R., Zhou, L., Kebede, A. A., Barres, B. 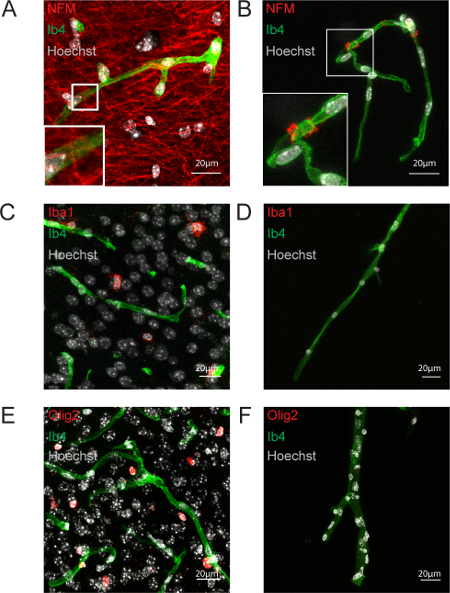 A. Pericytes are required for blood-brain barrier integrity during embryogenesis. Nature. 468, (7323), 562-566 (2010). Armulik, A., Genové, G., et al. 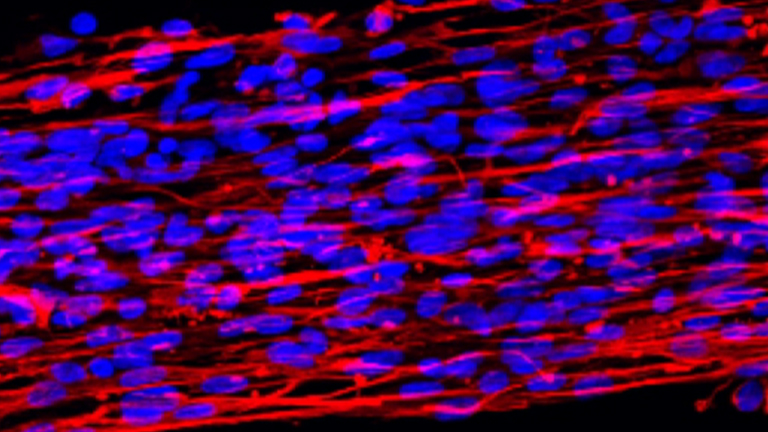 Pericytes regulate the blood-brain barrier. Nature. 468, (7323), 557-561 (2010). Hall, C. N., Reynell, C., et al. 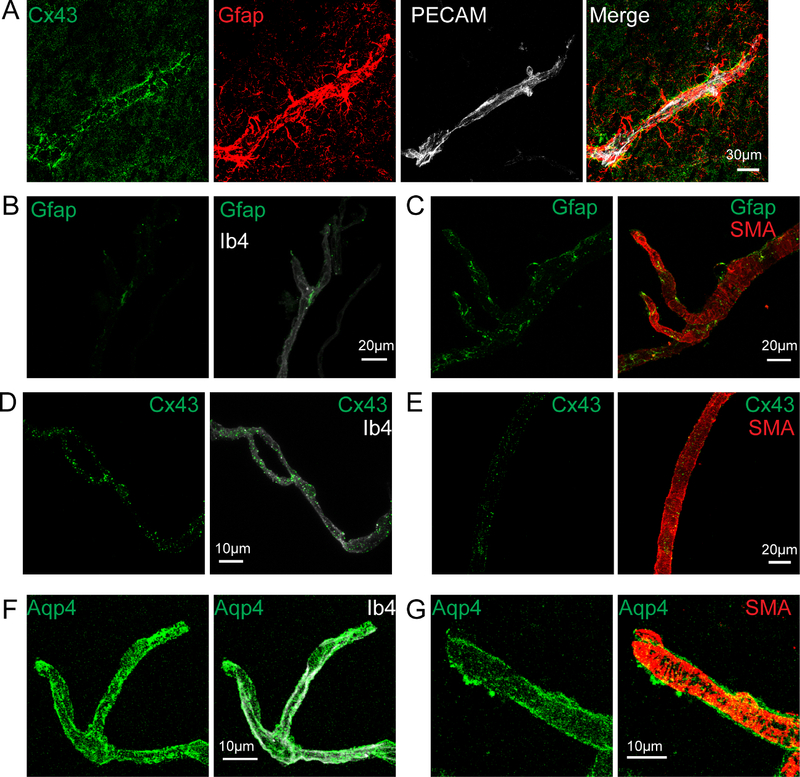 Capillary pericytes regulate cerebral blood flow in health and disease. Nature. 508, (7494), 55-60 (2014). Mathiisen, T. M., Lehre, K. P., Danbolt, N. C., Ottersen, O. P. The perivascular astroglial sheath provides a complete covering of the brain microvessels: an electron microscopic 3D reconstruction. Glia. 58, (9), 1094-1103 (2010). Abbott, N. J., Rönnbäck, L., Hansson, E. Astrocyte-endothelial interactions at the blood-brain barrier. Nature Reviews Neuroscience. 7, (1), 41-53 (2006). Allaman, I., Brain Magistretti, P. J. Energy Metabolism: Focus on Astrocyte-Neuron Metabolic Cooperation. Cell Metabolism. 14, (6), 724-738 (2011). Attwell, D., Buchan, A. M., Charpak, S., Lauritzen, M., MacVicar, B. A., Newman, E. A. Glial and neuronal control of brain blood flow. Nature. 468, (7321), 232-243 (2010). Iadecola, C., Nedergaard, M. Glial regulation of the cerebral microvasculature. Nature Neuroscience. 10, (11), 1369-1376 (2007). Brendel, K., Meezan, E., Carlson, E. C. Isolated brain microvessels: a purified, metabolically active preparation from bovine cerebral cortex. Science (New York, N.Y.). 185, (4155), 953-955 (1974). Yousif, S., Marie-Claire, C., Roux, F., Scherrmann, J. -M., Declèves, X. Expression of drug transporters at the blood-brain barrier using an optimized isolated rat brain microvessel strategy. Brain Research. 1134, 1-11 (2007). Dallaire, L., Tremblay, L., Béliveau, R. Purification and characterization of metabolically active capillaries of the blood-brain barrier. Biochemical Journal. 276, ((Pt 3)), 745 (1991). Boado, R. J., Pardridge, W. M. The brain-type glucose transporter mRNA is specifically expressed at the blood-brain barrier. Biochemical and Biophysical Research Communications. 166, (1), 174-179 (1990). Betz, A. L., Firth, J. A., Goldstein, G. W. Polarity of the blood-brain barrier: Distribution of enzymes between the luminal and antiluminal membranes of brain capillary endothelial cells. Brain Research. 192, (1), 17-28 (1980). Daneman, R., Zhou, L., Agalliu, D., Cahoy, J. D., Kaushal, A., Barres, B. A. The Mouse Blood-Brain Barrier Transcriptome: A New Resource for Understanding the Development and Function of Brain Endothelial Cells. PLoS ONE. 5, (10), e13741 (2010). Zhang, Y., Chen, K., et al. An RNA-Sequencing Transcriptome and Splicing Database of Glia, Neurons, and Vascular Cells of the Cerebral Cortex. The Journal of Neuroscience. 34, (36), 11929-11947 (2014). Boulay, A. -C., Saubaméa, B., et al. The Sarcoglycan complex is expressed in the cerebrovascular system and is specifically regulated by astroglial Cx30 channels. Frontiers in Cellular Neuroscience. 9, 9 (2015). Boulay, A. -C., Mazeraud, A., et al. Immune quiescence of the brain is set by astroglial Connexin 43. The Journal of Neuroscience. 35, (10), 4427-4439 (2015). Ball, H. J., McParland, B., Driussi, C., Hunt, N. H. Isolating vessels from the mouse brain for gene expression analysis using laser capture microdissection. Brain Research Protocols. 9, (3), 206-213 (2002). Murugesan, N., Macdonald, J., Ge, S., Pachter, J. S. Probing the CNS microvascular endothelium by immune-guided laser-capture microdissection coupled to quantitative RT-PCR. Methods Mol Biol. 755, 385-394 (2011). Okada, S. L. M., Stivers, N. S., Stys, P. K., Stirling, D. P. An Ex Vivo Laser-induced Spinal Cord Injury Model to Assess Mechanisms of Axonal Degeneration in Real-time. Journal of Visualized Experiments. (93), (2014). Winkler, E. A., Bell, R. D., Zlokovic, B. V. Central nervous system pericytes in health and disease. Nature Neuroscience. 14, (11), 1398-1405 (2011). Ezan, P., André, P., et al. Deletion of astroglial connexins weakens the blood-brain barrier. Journal of Cerebral Blood Flow and Metabolism. (2012). Simard, M., Arcuino, G., Takano, T., Liu, Q. S., Nedergaard, M. Signaling at the gliovascular interface. The Journal of neuroscience. 23, (27), 9254-9262 (2003). Dubois, L. G., Campanati, L., et al. Gliomas and the vascular fragility of the blood brain barrier. Frontiers in Cellular Neuroscience. 8, 418 (2014). Goldstein, G. W., Wolinsky, J. S., Csejtey, J., Diamond, I. Isolation of metabolically active capillaries from rat brain1,2. Journal of Neurochemistry. 25, (5), 715-717 (1975). Hjelle, J. T., Baird-Lambert, J., Cardinale, G., Specor, S., Udenfriend, S. Isolated microvessels: the blood-brain barrier in vitro. Proceedings of the National Academy of Sciences of the United States of America. 75, (9), 4544 (1978). Head, R. J., Hjelle, J. T., Jarrott, B., Berkowitz, B., Cardinale, G., Spector, S. Isolated brain microvessels: preparation, morphology, histamine and catecholamine contents. Blood Vessels. 17, (4), 173-186 (1980). Pardridge, W. M., Sakiyama, R., Coty, W. A. Restricted transport of vitamin D and A derivatives through the rat blood-brain barrier. Journal of neurochemistry. 44, (4), 1138-1141 (1985). Gerhart, D. Z., Broderius, M. A., Drewes, L. R. Cultured human and canine endothelial cells from brain microvessels. Brain Res Bull. 21, (5), 785-793 (1988). Luo, J., Yin, X., Sanchez, A., Tripathy, D., Martinez, J., Grammas, P. Purification of endothelial cells from rat brain. Methods Mol Biol. 1135, 357-364 (2014). Munikoti, V. V., Hoang-Minh, L. B., Ormerod, B. K. Enzymatic digestion improves the purity of harvested cerebral microvessels. J Neurosci Methods. 207, (1), 80-85 (2012). Weidenfeller, C., Schrot, S., Zozulya, A., Galla, H. J. Murine brain capillary endothelial cells exhibit improved barrier properties under the influence of hydrocortisone. Brain Res. 1053, (1-2), 162-174 (2005). Bowman, P. D., Betz, A. L., et al. Primary culture of capillary endothelium from rat brain. In Vitro. 17, (4), 353-362 (1981). Bowyer, J. F., Thomas, M., Patterson, T. A., George, N. I., Runnells, J. A., Levi, M. S. A Visual Description of the Dissection of the Cerebral Surface Vasculature and Associated Meninges and the Choroid Plexus from Rat Brain. Journal of Visualized Experiments. (69), (2012). Ohtsuki, S., Yamaguchi, H., Asashima, T., Terasaki, T. Establishing a Method to Isolate Rat Brain Capillary Endothelial Cells by Magnetic Cell Sorting and Dominant mRNA Expression of Multidrug Resistance-associated Protein 1 and 4 in Highly Purified Rat Brain Capillary Endothelial Cells. Pharmaceutical Research. 24, (4), 688-694 (2007). Warren, M. S., Zerangue, N., et al. Comparative gene expression profiles of ABC transporters in brain microvessel endothelial cells and brain in five species including human. Pharmacological Research. 59, (6), 404-413 (2009). Geier, E. G., Chen, E. C., et al. Profiling Solute Carrier Transporters in the Human Blood-Brain Barrier. Clinical Pharmacology and Therapeutics. 94, (6), 636-639 (2013). Seetharaman, S., Barrand, M. A., Maskell, L., Scheper, R. J. Multidrug Resistance-Related Transport Proteins in Isolated Human Brain Microvessels and in Cells Cultured from These Isolates. Journal of Neurochemistry. 70, (3), 1151-1159 (1998). Urich, E., Patsch, C., Aigner, S., Graf, M., Iacone, R., Freskgard, P. O. Multicellular self-assembled spheroidal model of the blood brain barrier. Sci Rep. 3, 1500 (2013).